Purchase this product now and earn 460 NewBonneville Bucks! A new look for your modern classic Triumph. 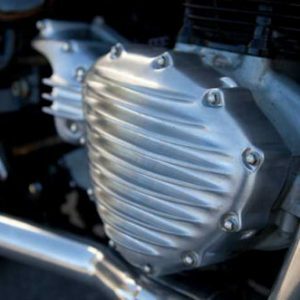 If you’re tired of the same old muffler, now there is a more aggressive, tucked-in look for Thruxton, Bonneville and Scrambler. This new design is smaller and lighter, finishing just before your bottom shock bolt. The cone has a maximum diameter of 3.75” and a large 2” opening on the reverse cone. A lot of mufflers with large outlets have a “hollow” sound, but with our unique double-step rifled perforated core you still get a tight solid tone! 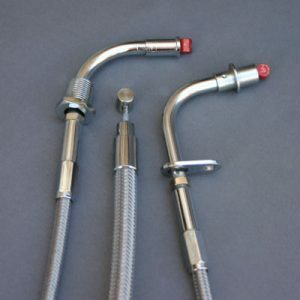 Fits the original equipment Triumph headers and uses the stock muffler clamps. 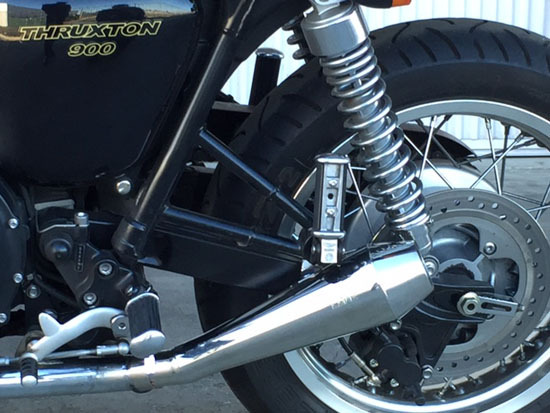 Muffler kit includes a frame mounted kick stand stop that replaces the stock muffler-mounted stop. All mufflers come in bright polished 304 stainless steel. Due to the minimal size of these mufflers, you should expect them to be somewhat louder than our Dominator Sport mufflers.